Colombia's Emeralds: History & Lore. The Republic of Colombia is situated in Northern South America, bordering the Caribbean Sea to the north, between Panama and Venezuela, and bordering the Pacific Ocean to the west, between Ecuador and Panama. It borders also with Brazil to the south-east, and Ecuador and Peru' to the south. Its area total for 1,138,910 sq km and it is approx double the size of Texas. Its climate is tropical along coasts and eastern plains and cooler in highlands. Santa Fe de Bogota' is its capital, situated in the central part of the country in the oriental highlands, with a population of approx 7millions. The country total population of 45 millions is divided as mestizo (mix between European and Amerindian) 58%, white 20%, mulatto 14%, black 4%, mixed black-Amerindian 3%, Amerindian 1% . The Spanish spoken Colombia is considered the most refined and articualte in the world. Colombia is rich in natural resources such as petroleum, natural gas, coal, iron ore, nickel, gold, copper, emeralds, hydropower. The Emerald remains one of the most popular gems today and is one of the rarest and most valuable precious stones. And Colombia holds the tradition of producing the world's finest. In the 1500, as the Spaniards arrived in the New World, realized that they had a valuable gem resource to exploit. The Muisca and Chibcha Indians, the Colombian natives of the northern regions of Bogota', fought fiercely the Spanish Conquistadores to protect their heritage and the location of the emerald mines as well. Nonetheless, the Spaniards took control and began to bring the green gems back to Europe. The rest is history. 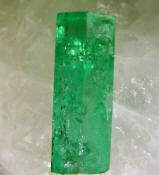 Colombia supply 60% of the world's emerald output and 80% of the highest quality emerald available in today's market. In Colombia, north to the border with Ecuador, the Andes split in three parallel ranges, western, central and eastern ("cordillera occidental, central y oriental"). The main Colombian mines are located in the "Cordillera Oriental" region of the Colombian Andes mountains, also referred to as "The Emerald Belt". The Chivor mine in the eastern region is the only major privately owned emerald mine in Colombia. 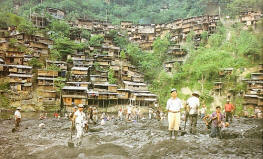 The Muzo mine in the western region is leased to the government for 10 year periods to the Sociedad de Mineros Boyancences. Muzo is located about 120 kms. north of Bogota', at an altitude of 2,200 feet (750 meters) above sea level. The region is hot and humid, and surrounded by thick tropical vegetation. The mine embraces the Itoco river, an affluent to the Minero river. 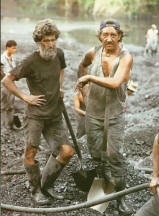 There are several mines in the area and the most important are Coscuez, Pena Blanca, Taquendama, El Cholo. Emeralds are found deep down the earth in black calcium-rich shale, often fractured and containing emerald agglomerates with calcite, barite and pyrite. 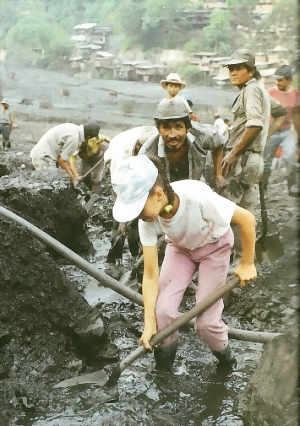 The mining area and the official "cortes" or mine shafts are all controlled and gunned guarded, but there are hundred shafts unknown and undocumented. Excavators, hydraulic jacks and dynamite are also used on the open air to cut huge swaths into a mountainside. Large quantity of water is then released from a reservoir above, to wash the area just worked free of debris. This allows to loosen up the emerald bearing material (carbonaceous limestone, shale, salt) and expose the calcite veins. At this point, all the mechanized equipment is stopped, and miners armed with picks and shovels, work this material in search for emerald crystals. 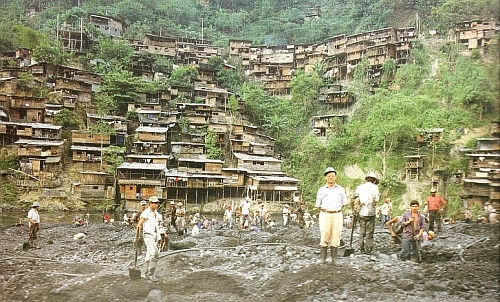 It is estimated that during this process a mine gets approx 35% of the emerald production, with the rest being destroyed during the process or streamed down the mountain below. However, there are also the miners in shafts and tunnels below the ground, that recuperate emeralds for the mine leasing company. The rest is smuggled out (40% according to officials) and another 10% divided in between the crew, as part of the contract with the mine officials. 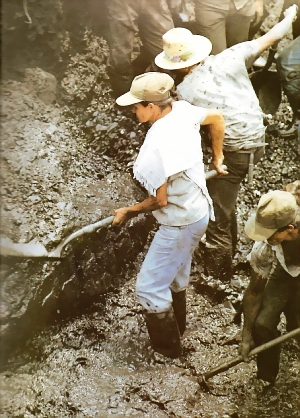 When the emerald bearing has been searched thoroughly by the mine, the discarded tailing is then bulldozed or streamed down to the Itoco river below, where hundreds of "Guaqueros" (literally "treasures hunters) pan and prospect these murky water for emerald of any grade, usually of very low quality. It is the quest of being at the right moment at the right time, the lure of instant wealth, or perhaps the mystical calling of the black earth below, all of these and many other reasons that motivate men, women, children, elderly to dwell and work in unstable, unhealthy and dangerous conditions for many weeks at the time. In the immediate pueblos (small towns) surrounding the mining areas, emerald roughs markets is held every week end. It is the occasion to move the findings of the previous weeks and get the hard cash. Rough emeralds ("Esmeralda en bruto") are changing hands, bought and sold quickly. The official output of the mine is instead flown by helicopter. No matter who buys the rough, no matter the transportation mean, every single piece find its way to Bogota', the capital, where it will be cut, oiled and sold again.